Playwright Rory Mullarkey`s forthright, faithful and funny new translation of Anton Chekhov`s final masterpiece, The Cherry Orchard, is tailor-made for the launch of Bristol Old Vic`s Year of Change? season. A £9.3 million redevelopment programme will shortly reveal the facade of the theatre’s King Street home for the first time for 200 years – a metaphor, perhaps, for The Cherry Orchard`s matching theme of the need to embrace change despite the desire to cling onto what is familiar. Michael Boyd, who trained in Moscow but has never before directed Chekhov, takes a free-flowing approach in this lucid and refreshing production. It is adventurously, if at times a little clumsily set by Tom Piper in-the-round, while equally in keeping with changing times, Boyd`s cast is not just diverse but multinational, including actors from Japan and Hungary. 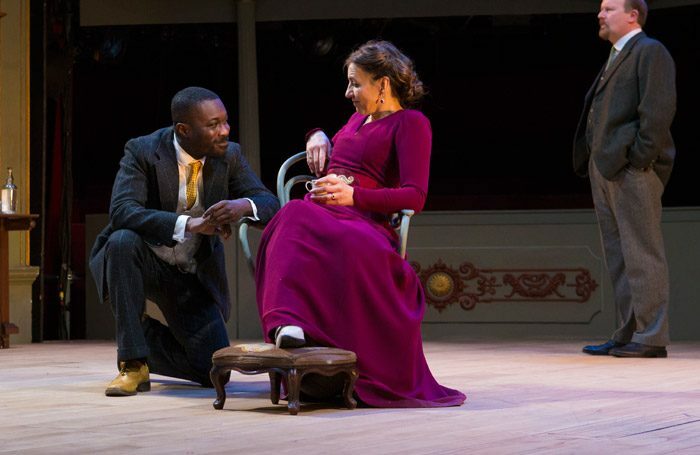 As rebellion looms large, the passing of the social baton is poignantly wrought in the relationship between Kirsty Bushell`s aristocratic landowner Madame Ranyevskaya, longing for the past but reckless over money, and Jude Owusu`s aggressively self made merchant Lopakhin, her long-time secret admirer who saves her from ruin by buying the cherry orchard. Ranyevskaya`s verbose brother Gayev (played by Simon Coates), along with the love-lorn Varya (Rosy McEwen) suffer similarly from chronic self-delusion, and it is Enyi Okoronkwo, as militant student Trofimov, who best represents both the play`s – and the Bristol Old Vic`s – motif of the challenge of the new and the revolution to come.